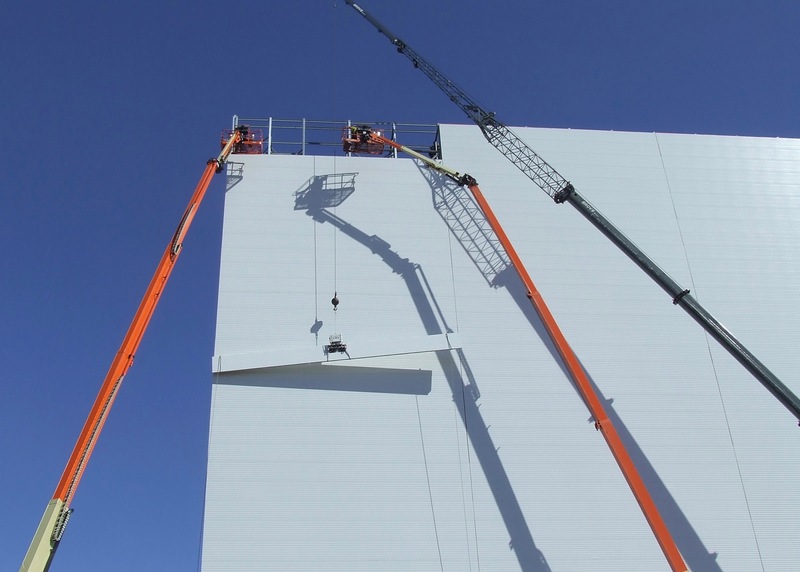 It’s taking longer than expected to complete the tallest building in Sackville, but Evelyn and David Ernst say the state-of-the art, 44-metre, frozen food storage freezer should be ready in June. 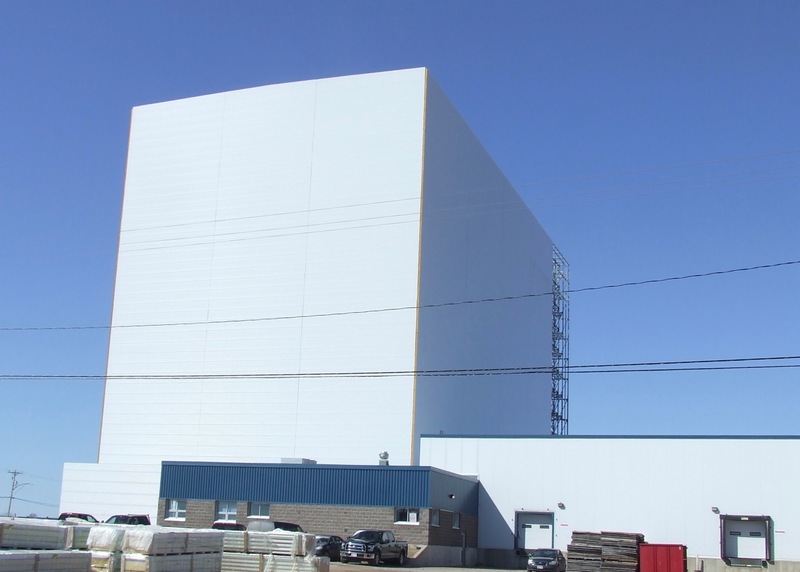 The Ernsts, co-owners of Terra Beata Farms, are building the 14-storey freezer in the Sackville Industrial Park in partnership with Burnbrae Farms, the Ontario-based company that operated the egg-processing plant there before closing it in 2011. 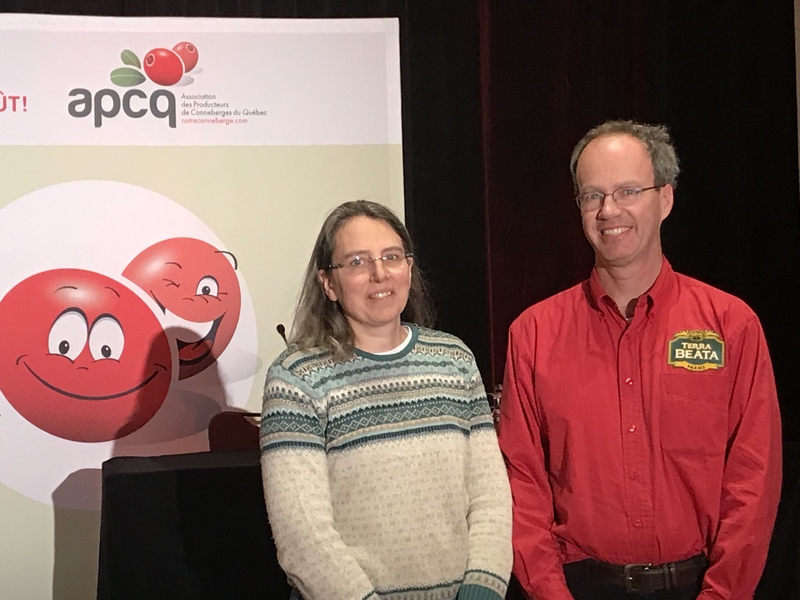 On Tuesday, the Ernsts, who are both 50, were cruising along the TransCanada Highway toward Sackville after attending a two-day cranberry convention in Quebec City. The Ernsts have been talking and learning about cranberries since the late 1990s when they bought a 12-acre peat bog across from their home on Heckmans Island near Lunenburg, Nova Scotia. “We had caught all the fish because there weren’t many left to catch in the ocean,” David said, referring to a time when High Liner had decided to decommission its fishing boats because of dwindling stocks. “And so, David thought this does not look very good,” Evelyn said, adding that when the nearby land came up for sale in a tax auction, he said they should buy it. After David took a cranberry-growing course from the Nova Scotia department of agriculture, the Ernsts were on their way. Three years later, when they couldn’t sell their first crop, they bought used home freezers to store it, taking their first step into food processing. Eventually, the Ernsts learned that although people would buy fresh and frozen cranberries, they also wanted products Evelyn had made to demonstrate how versatile cranberries could be, so today they sell a variety of them including juice, preserves and dried fruit. They still operate their farm, but also buy cranberries from about a dozen other farms in Atlantic Canada, handling more than five million pounds a year and serving markets in a wide variety of countries including Germany, France, Ireland, Poland, Latvia, Israel, Australia and New Zealand. Their products are also sold in stores across Canada. Over the years, the Ernsts have been able to expand their operations thanks to a series of repayable loans provided by the federally funded Atlantic Canada Opportunities Agency. The Ernsts decided they needed the freezer building in Sackville to take control of the frozen cranberries they were storing at a variety of rented facilities where costs were steadily rising and where it was increasingly difficult to keep track of their inventory. David explains that the new facility is state-of-the art, known in the trade as High Bay Cold Storage, a fully automated storage and retrieval system developed by SSI Schaefer. “The structure that everybody saw being built through the summer is actually racking that will work like shelves to hold pallets of product,” Evelyn says, adding that the frozen food will be moved into the cold storage on a conveyor system where it will be picked up by a crane to be placed on the racking. “The racking is set up so that there are four long aisles from one end to the other end and the cranes run back and forth along railway tracks that are placed in each aisle so each crane can pick up product or retrieve product from either side of the track that it runs on,” Evelyn explains. 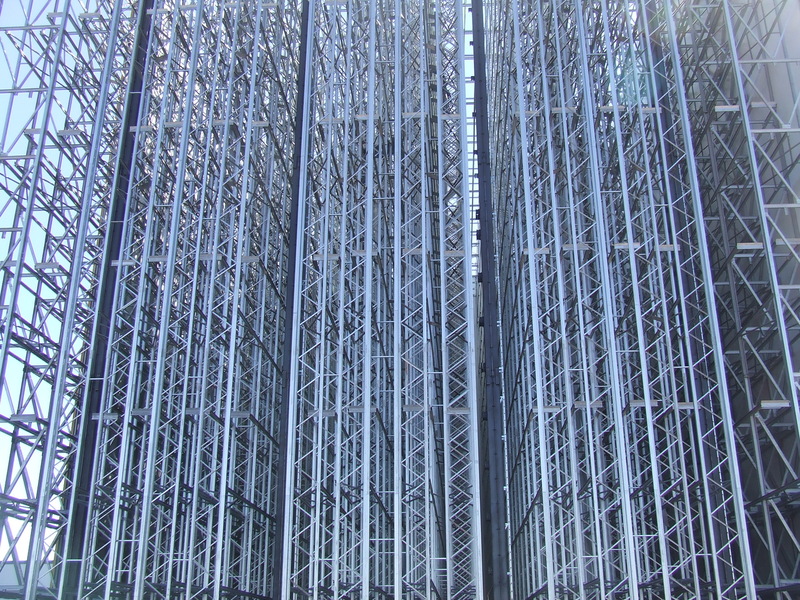 To see a video demonstration of an automated SSI Schaefer cold storage facility in Belgium, click here. Since the Ernsts will be using only 20 per cent of the capacity in the huge storage building, they’re planning to rent space to other frozen food companies offering a centrally located, fully automated storage site with computerized inventory tracking. David says the facility can hold up to 30 million pounds of frozen food. Although the project won’t be finished until June, the Ernsts point out that they’ve been using the former egg plant building in partnership with East Coast Wild Blueberries of Great Village, N.S. 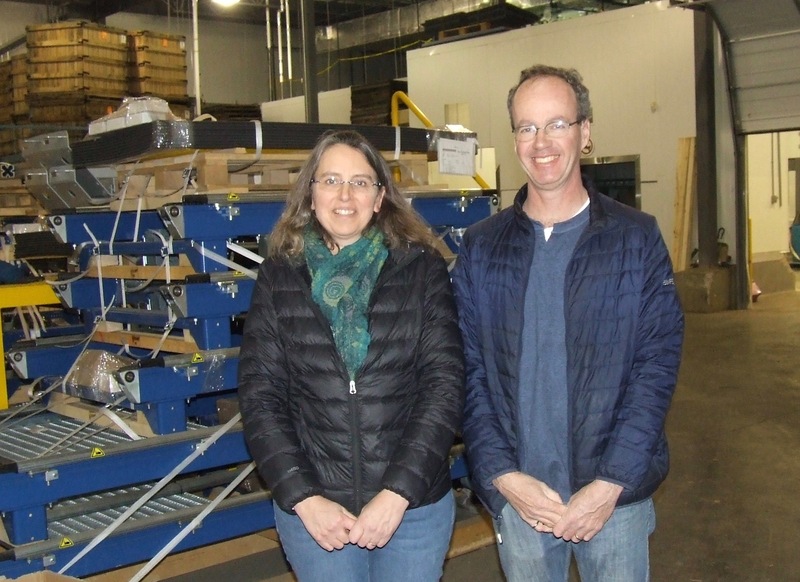 “We already installed and ran last season a blueberry and cranberry cleaning line,” David says. David says the fruit was cleaned, dried and quick frozen. Once the cold storage building is ready, the fruit will be stored there saving the costs of trucking it to other sites. At the moment, the Ernsts have 29 employees at their farm in Nova Scotia and three in Sackville, but will be needing more workers here when the full facility is up and running. “The only thing I’d like to find now is the brightest and best Sackville young people,” David says, adding that they want a mix of older, experienced workers as well as younger ones. The Ernsts say they’ll need versatile people, everything from line workers and fork-lift operators to a facility manager. “We want people who feel like they own the place,” David says. This entry was posted in Technology, Town of Sackville and tagged Burnbrae Farmers, David Ernst, Evelyn Ernst, SSI Schaefer, Terra Beata Farms. Bookmark the permalink. I do very much hope that they become successful in their business. I sure hope its a plant that eventually can get many more employees. It sure helped our business a lot during the first part of the building process. The workers would come to the store 2 or 3 times a day and really helped boost our store’s business. Would be great to see 29 employees at this location or even more. Glad something was allowed to be built that will bring traffic and jobs to our end of town as it’s needed. We have people stop daily to ask staff what the big building is as it can be seen clearly when travelling the TCH. Again best of luck to the owners and current and future employees. I’m thrilled that the Ernsts are building a state of the art high level frozen food storage facility in Sackville! And the 14 story building looks really cool! I echo everyone’s comments! Long life to your business and welcome to the neighborhood :). Good point. I’m wondering if you have brought the issue up with the town engineer or any of the council or mayor? I know that we, as business owners, have tried several times to get answers to why there are no sidewalks or crosswalks in the area? The former police department (likely 20 years ago now) had submitted to the town engineers and council a report they did and it clearly stated the town needed to add sidewalks and crosswalks on this end of town. And to this day, nothing? I regularly see the kids and teachers from the daycare walking to our business and over toward the industrial park to take recyclables having to cross the busy area without having any sidewalks or crosswalks. I try and keep a path free of snow so locals can cut through my business in the winter months as it is totally unsafe to be walking on the side of the road anywhere near the intersection of Cattail/Bridge. We had asked why there has been nothing done in the area and all we got was a response from the engineer that because no sidewalks they won’t put a crosswalk. Yet in other areas of town there are crosswalks leading across areas without sidewalks. It seems it may take some kind of accident before the town is willing to add needed things such as sidewalks and crosswalks to this area. I walk most days this time of year to and from my home and prefer to take the path down beside the tch and then down cattail ridge and I can accept that this area isn’t where most would choose to walk, but it works for me. I don’t see a need to do anything further up the ramp but definitely down toward the business area would be welcomed to help make it safer for those going to one of the businesses in the area, or those out enjoying a walk or jog on this end of town. The town certainly hasn’t had any issues in making it safe for pedestrians on the other end of town. Kelly, you raise a good point, but I believe in your explanation you have answered your own question. Town records show that Yes, a local study WAS done by our local police force (back when we still HAD our own force), and the report WAS presented to Council, and the recommendation WAS made to add sidewalks and crosswalks in that area … the report was “accepted” and then just shelved, where it still sits to this day. More recently, in the fall of 2017, Town accepted a report from a company called Ekistics, whom they had contracted to study the Exit 506 area and make suggestions. That report ALSO recommends sidewalks and crosswalks, just as the earlier LOCAL study had done. This time though, since the study had been ‘hired out’ to an ‘outside consultant’, THEIR report was taken much more seriously by those in charge. The result is that funds have been included in this year’s budget to rebuild that area of roadway, including those all-important sidewalks and crosswalks. The irony here is that the Ekistics report largely just reworded many suggestions and comments they had collected by talking with a lot of different local people in their study process. So it would appear that observations or suggestions which originate with LOCAL sources are not given any importance or credibility, while those SAME suggestions coming from an OUTSIDE source are considered very important and acceptable. We have seen this same outcome with other issues as well. In short, views of the LOCAL CITIZENS are met with skepticism and disdain, while the SAME VIEWS coming from an OUTSIDE SOURCE are considered to be valid and worth acting upon. Kelly, I am looking forward to the newly built service road between Robson Ave and Bridge Street being finished and upgraded this summer to a proper trail, with a crusher dust topping, to enable the children from the Bridge Street Children’s Academy to have a proper walkway and nature experience area. Thanks for keeping that area clean – I do walk through it all the time, precisely for the reasons that you mention. For the amount it cost to repaint crosswalks in fancy colours elsewhere in the town, I’m sure that the money could have been spent at that location for better safety. But no virtue signalling would be had out of that. Alice, do you understand what an industrial park is? It is for this exact type of building. This is not downtown sackville. Does Russell metals fit your image for town? We desperately need business in the town and this is a much needed thing and I applaud it. Personally, I find that it looks lovely as it is. It has that look of economic progress: an industrial building in an industrial park – where it belongs – bringing with it a potentially large number of jobs, both directly and indirectly (i.e., supporting local cranberry farmers by having an additional outlet for their product, truckers trucking product, people stopping at the Ultramar because they’re involved with the building, etc. I’d say that it’s pretty much the best thing that has happened to this town since I’ve been here, over 10 years! I’d also like to thank Bruce for speaking to the Ernsts and bringing us all up to date on what’s going on! Incidentally, I’ve eaten their dried cranberry product and use them in salads regularly. While they’re a little more expensive than some of the other brands out there, I find that they have a superior texture and taste. I suspect that this is because they don’t add oil to them. They’re worth the extra cost, in my opinion. Wow– those are their products? Well, I agree with you Louis (= Chef Luigi :)). Delicious! I also echo your comment on the New Wark Times. It is always refreshing to read it, especially with its good news. Thank you Mr. Wark! I wonder what the carbon footprint of this monolith will be? And I wonder if it will hum as all fridges do?? It looks like we could also have a drive-in theatre option on the way – dual purposing buildings is really sustainable and green AND in keeping with our climate action plans and such … Just kidding.. carbon doesn’t concern me but the cult of climate hysterics does.. remember #carbon tax is theft and Canada is a carbon sink .. http://plantsneedco2.org .. How’s everyone enjoying that gas price hike? Not so much eh? Thanks to all the people for promoting ‘more taxation’ .. how would we ever save this planet without you. To answer your question Tantramar Landowners Association, although I voted for the actual Liberal government in power, I disagree with its carbon tax. On that point, I agree more with our Premier, Mr. Higgs and with you (please Sackvillians don’t shoot me :)). This being said, I have wished we had a green plan already in place in order not to get where we are now– a provincial plan or, even, a joint one for the Maritimes, as suggested once by Councillor Mesheau on this platform. Now Sackville is is talking about climate emergency declaration… The timing seems a bit ironic to me, as it seems to be following a “leaked” report from the federal government. The latter coincides with the new imposed carbon tax. What a coincidence all this 😊. Anyhow, as a researcher, I am curious: What methods the authors of the report (i.e., Government scientists with some other university scientists) used? If it was a literature review, was it a systematic one? Do they report on their potential sources of bias? How did they mitigate them? It was an empirical study, what are the margins of error? Related to this, I read this morning Ms. Katie Tower’s article in the Sackville Tribune on “children’s stress over the future of our planet” (https://www.sackvilletribunepost.com/living/stressed-over-the-future-of-our-planet-295962/). My first reaction was: Is this a prelude to the declaration of a climate emergency state? After predicting this scenario in my mind, I read her second article announcing this possibility (published an hour ago?). I agree with Coucillor Mesheau again. I tend to me pragmatic too. You know? I am always fascinated by how other places that are on the verge of much more imminent risks (i.e. of war!) at almost every minute of the day (or night) do not catastrophize like us. I am thinking specifically of Lebanon (Middle East). Every single politician in Beirut remains calm, including the most vocal folks against Israel and/or Syria. They prefer to call for stability despite the persistent urgency of regional matters that can escalate in literally seconds. By doing so, they reassure the population whilst giving both peace and economy a chance (the two usually go hand in hand). Same for the population: Lebanese people, young and older, remain calm—despite a remarkable lucidity about their vulnerability and resiliency. (1) As a town or a community, what do we gain from a declaration of a “climate emergency state” politically, psychologically, or scientifically? I am afraid such language would make us prone to take emotionally-charged decisions (instead of acting calmly and strategically). Is this the wisest coping strategy when facing our planet’s climate problem? & (2) As for Tower’s first article in the Sackville Tribune, there seems to be an ecological lobby in our town that is becoming increasingly powerful. Ironically, we can even say that a socially-acceptable form of (crony?) capitalism has emerged. That is OK even if it contradicts what this lobby vocally denounces. What worries me more is the narrow focus on a single problem of the planet (the climate) whilst excluding issues like poverty, lack of jobs or other potential risks. This climate change obsession can easily become like a cult. On that one, despite the wonderful intentions of people (caring for our beautiful planet), I also see a slippery slope, dangerous to kids/youth’ well-being. Anxiety can stem from a membership to a cult rather than from whatever noble truth cults claim to believe in or fight for. The stressor may not be the climate but rather our irrational reactions to this real problem. To conclude, we can sometimes fall into the trap of our own noble beliefs when we become “illuminated” by “the” truth; there is a reason why I sometimes tease activists in my mind by referring to them as “the illuminated” or “les illuminé(e)s” :). More alarmingly, during a journey of any “combat”, we may burn out. Perhaps more alarmingly, we can also become vulnerable to potential imposters or charlatans… Are our children or ourselves equipped for such a risk? I could go on and on with other references but I’ll leave it to you to research further where your highly spun information is coming from. Needless to say, I doubt that most readers of The New Wark Times pay any heed to any of your posts anyway, so why not save us all from the aggravation and feed your propaganda to the other members of the TLA, if there actually are any. where you can see more, if you want. I’d say she’s thus one of the least anonymous people that post here. Now, here’s the thing: it’s completely unsurprising that the likes of coal companies finance outfits like plantsneedco2.org. I mean, their industry is getting killed off, so they’re obviously doing what they can to fight back. For American companies buying discounted Alberta oil, a pipeline would mean higher prices. Throwing a few million into funding anti-pipeline activity is a cheap way to maintain high profits from Alberta oil having nowhere else to go. Again, a fairly obvious move in defense of their own interests, but one highly damaging to our country when not countered by sensible government. But it gets weirder: some “climate change” activism is sometimes funded by… oil & gas companies trying to protect their interests against the building of nuclear power plants. It is indeed surprising that nuclear is so out of fashion. I read your comment Louis. Interesting. Whilst working, I listened to an interesting interview on the radio with a well-respected researcher, Dr. Pineau, holder of Canada Chair in energy sector management (HEC– University of Montréal). I am sure we can find his writing in English as well. He explains very well the solution to the climate change problem and what we can do about it. Louis very interesting and I’m going to read more into the sites you highlighted. My son is going to enter into chemical engineering this fall and is working with a Nb power engineer on how to use nuclear waste to make more power. Hoping my son and many others of their generation develop answers to energy needs that will both help the environment and provide business and future investment stability. Because protesting isn’t going to get anything accomplished in my mind! Congratulations to your son. One engineer can solve problems that thousands of “activists” can’t. Hi Louis, Well, I guess I’m not in the ‘pretty much everyone’ club, because I don’t know who this Sally is. I’ve followed the link to the blog before but I couldn’t find any information on it anywhere about the blog author or authors – the only thing I found were links to other propaganda sites. So to me I guess she is still fairly anonymous. Did I miss that information somewhere in the blog? Please let me know if I did. Google: “Indie Media Eastcoast”, “Sackville Uncensored” and “Tantramar Skate Park” for some of her projects. It’s the same person who puts up the “You are beautiful – pass it on” signs. You may see her walking her dogs. Maybe that helps in knowing whom I’m talking about. In my opinion, Sally is always happy to talk, even (especially?) to people who don’t agree with her. While I strongly disagree with her on many things (though we do see eye-to-eye on many others! ), whenever I’ve run in to her, we always have interesting conversations. Sometimes our positions might even change a little as a result. I’d say that Sally doesn’t get “triggered” easily and believes in others’ freedom of speech. Which is a breath of fresh air in this town! Do try to have a chat if you see her, would be my advice. One way or another, it’ll be interesting. Great, thanks for the info Louis. I’ll definitely try to have a chat with her if I ever see her. I’ve likely said this before, so I might sound like a broken record 🙂 but my main concern is the effect that being able to post comments, while hiding behind a pseudonym, has on the level of discourse in comment sections like this. I don’t know how old you are, but in the prehistoric days before 1 AI (After Internet), if a person wished to register an opinion or complaint by writing a letter to the editor in a local paper, which was about the only venue open to the public in those times, they were required to sign their name to their letter or it wouldn’t be printed by the paper. Presently, if you check out comments on different blogs, user forums, Youtube, etc., you’ll find the vast majority of people use pseudonyms and the level of personal insults and viciousness is quite disturbing. Many of the comments from TLA that I’ve read on this blog echo that trend. I’m all for free speech as well, which is vital in a democratic society, but a person should have to take responsibility for their actions or words. I’m old enough to remember Before Internet, even though I got on quite early, in 1993! Now, Sally is far from anonymous, so I’ll diverge from the specifics of that situation to defend anonymity in general. We live in a society where people are often “softly” persecuted for their views. To be more specific, this happens mostly to people who have right-of-centre views, and not so much for left-of-centre ones. I know this quite well, because I hold some of both, and I see the different reactions. Having right-of-centre views in many cases puts one at risk of getting fired, having problems with child protection agencies, being shut out of social media, or even plain old assault. Freedom of expression is more theoretical than real in those circumstances. Being able to operate under a pseudonym and/or to keep one’s more personal details (residence address, telephone number, where kids go to school) private is vital in such circumstances, in order to express oneself while retaining something approaching a normal life. I have very personally seen what the so-called court system does to people who open their mouths to speak the truth, and I assure you that as a result, I have very little faith in society’s protection of views that go against powerful interests in general. That being said, I’m fortunate to be among the people least subject to “soft” persecution: the vast majority of my business is elsewhere, and mostly from people who either don’t care about my views (or share a lot of them). That sort of “soft” pressure doesn’t work on me, because of my circumstances. But if, for example, I worked for government – or probably anything approaching a large formal organisation – I’d probably have to post under a pseudonym, lest I be fired (presumably on some other pretext). Taking “responsibility” for one’s views in that way is often not practically possible: imagine that one has kids to feed, etc. So people shut up and keep their heads down. Which doesn’t mean that they agree, only that they’ve been cowed into submission. Isn’t it better to know what people think, even if anonymously, than to frighten them into silence? Now, I realise that there’s also a phenomenon of gratuitous insults and “trolling”, and that obviously doens’t help the discussion – but that’s a different matter. If you’d like to try a social experiment in order to see what I mean, I suggest the following “mild” experiment: get two T-shirts. One praising Maduro for making “Venezuela Great” and one praising Bolsonaro for making “Brazil Great”. Walk around Sackville with both of them, and see which one gets you more abuse. (Note: I’m not equating Bolsonaro and Maduro! I’m just proposing this as a social experiment.) I decline responsibility for any assaults if you suffer any. My guess would be that you won’t be physically assaulted, but likely verbally insulted. Similar experiments abound, all at your own risk, of course :-). Well, I still don’t agree with you Louis, but in the words of Canada’s elder statesman, Joe Clark (Who? ), perhaps we can agree to disagree.